From cabbage to kale, there’s a lot to love about cruciferous vegetables. There is evidence to suggest that cruciferous vegetables may reduce the risk of cardiovascular disease. All veggies are good for you, but cruciferous vegetables are in a special category. This group of vegetables is rich in disease-preventing nutrients, including vitamins C, E and K; folate, minerals, and several carotenoids, including beta-carotene, lutein, and zeaxanthin. Broccoli, cabbage, cauliflower, and Brussels sprouts are well-known examples of cruciferous vegetables, but did you know that this incredibly healthful class of vegetables also includes arugula, bok choy, broccoli sprouts, collard greens, horseradish, kale, kohlrabi, radishes, rutabagas, turnips, watercress and wasabi? The 2015–2020 Dietary Guidelines for Americans recommend that adults consume 1½–2½ cups of dark-green vegetables a week, including cruciferous vegetables. Health Benefits Galore. These intensely flavored vegetables are unique sources of glucosinolates, a large group of sulfur-containing compounds associated with health benefits. Glucosinolates are broken down to form compounds (isothicyanates and indole-3-carbinol) that are shown to trigger the death of tumor cells, both in the lab and in animals. 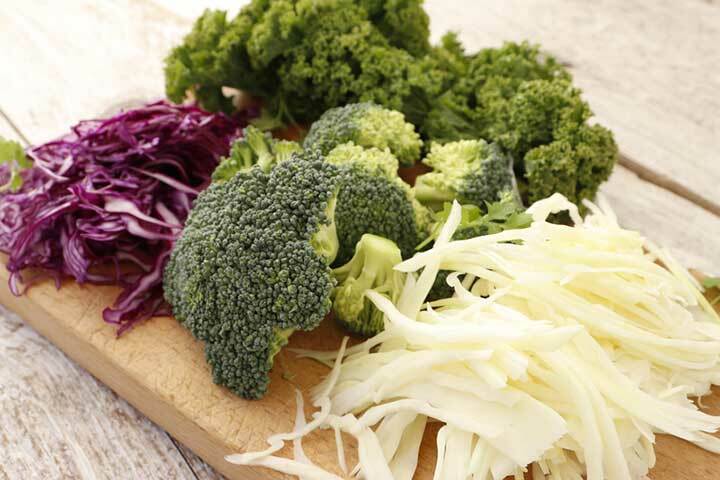 High intake of cruciferous vegetables has been associated with a lower risk of developing cancers of the bladder, breast, colon, endometrium, stomach, lungs, ovaries, pancreas, prostate, and kidneys. There is also evidence to suggest that cruciferous vegetables may reduce the risk of cardiovascular disease. One study found that those with the highest intake of cruciferous vegetables (six times per week) had a 27 percent lower risk of having a heart attack, compared to those who ate cruciferous vegetables only once a week. Another study found that eating about 2½ stalks a week of high-glucosinolate broccoli resulted in a significant reduction in blood levels of low-density lipoprotein (LDLs). Elevated LDLs are a proven risk factor for cardiovascular disease. Cooking With Cruciferous. The amount of glucosinates broken down into disease-fighting compounds depends, in part, on how produce is prepared. Chopping or chewing raw cruciferous vegetables allows enzymes in the food to convert glucosinolates to isothicyanates and indole-3-carbinol. While all cooking methods reduce these compounds, steaming, microwaving and stir-frying result in less losses than boiling. Ah, cruciferous vegetables—you either love ‘em or hate ‘em. Research shows that whether they make your mouth water or your lips curl in disgust may depend on your genes. About 25 percent of the population are genetically sensitive to bitter tastes, like those in cruciferous vegetables, and the strong perception of bitterness overwhelms their natural sweetness. Regardless of where you fall on the cruciferous love-hate scale, here are tips for making them enjoyable. Roast Them. This caramelizes cruciferous vegetables, bringing out the sweetness to tame the bitter. Add a Bit of Salt. Cut the intensity of the bitterness, for those who are sensitive to it, with salt. Sprinkle in Some Sweetness. Think a touch of honey with roasted Brussels sprouts. One study found that even the artificial sweetener aspartame has a powerful ability to mask the bitter flavor of cruciferous. Puree It. Try blending seasoned cauliflower into a healthy, creamy sauce. Tags a heart attack, add, beta carotene, cancers, cardiovascular, cardiovascular disease, carotenoids, cauliflower, cooking, cruciferous vegetables, dietary guidelines, dietary guidelines for americans, endometrium, folate, food, glucosinolates, having a heart attack, health, heart attack, honey, kale, lipoprotein, low density lipoprotein, nutrients, Pancreas, Prostate, tumor, vegetables, vitamins, zeaxanthin. I have been obsessed with broccoli/cauliflower salad for months now. I make a bowl of it (about 5 cups of vegetables every 3 days and eat the whole thing myself. I don’t know why this is, but I won’t complain. Until the past couple of years, I’ve hated vegetables my whole life.